Dave Gibbons at the WBB! I've discovered over the last few years that one of the reasons I read so much is because you have to wade through a lot of mediocre books to discover one that truly resonates with you. You know the kind - that book you can't put down even though you have to eat, sleep or work. And when you find such a book, you can't wait to tell all your friends about it. 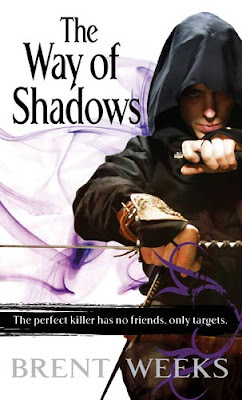 The Way of Shadows, by Brent Weeks, is such a book. It was lucky to get such an amazing cover treatment. The catchy tagline, "The perfect killer has no friends. He only has targets." adds to the mystique. Priced at $9.50 in Canada it's already flying off the shelves. And as an added bonus, Orbit is publishing the entire trilogy in time for the Christmas gift giving season. Still not sold? Then listen to this. Durzo Blint is the city's most successful wetboy. But he's never taken an apprentice, until now. The characters are all sympathetic, an admirable feat considering their professions. Each character is forced to grow or die as they face the consequences of their actions - or their inactions. The plot moves at a quick pace as Azoth learns more about what it means to be an assassin in a city run by the equivalent of the mob. There's a touch of romance, a lot of action and the ending is full of surprises you won't see coming. And of course, murder.